In Avoyelles Parish, the areas around Spring Bayou, Big Bend, and Brouillette are the most affected by the flood. But due to low rainfall amounts, the rivers are not as high as previously expected, and water levels are falling. Many Avoyelleans are relieved. The Mississippi River flooding forced between three and four thousand people in Louisiana to evacuate their homes. About thirty families have found refuge in the mobile housing units of Magnaville (aka Canadaville) near Simmesport in Avoyelles Parish. Magnaville originally served as a shelter for hurricane Katrina evacuees of New Orleans from 2005 through 2010. On May 6, 2011, the President of the United States of America declared emergency for Louisiana due to the threat of a flood disaster that might equal the catastrophe of 1927 when “the Mississippi River remained at flood stage for a record 153 days.” . 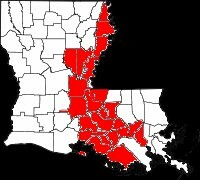 The U.S. Department of Homeland Security’s Federal Emergency Management Agency (FEMA) announced that federal aid has been made available to the State of Louisiana to supplement state and local response efforts in the area struck by flooding beginning on April 25, 2011, and continuing. Affected are the parishes of Avoyelles, Ascension, Assumption, Catahoula, Concordia, East Carroll, Iberia, Iberville, LaSalle, Madison, Pointe Coupee, East Baton Rouge, St. Charles, St. James, St. John, St. Landry, St. Martin, St. Mary, Tensas, Terrebonne, West Baton Rouge, and West Feliciana (where the Mississippi River surrounds the Angola Prison on three sides). Slideshow by Charles Addison Riddle, III, whose grandfather was the Red Cross Chairman during the great flood of 1927.